Daily Routines – Integrating signing in your daily life. Creating Opportunities – Giving you child more opportunities to learn. Baby-Initiated Signing – Being guided by your baby’s interest in signing. Children in deaf families routinely sign at six months’ old. What is their secret? Repetition! A child with deaf parents or siblings is constantly getting exposure to signing. This section will show you how to ensure your baby receives frequent exposure to signing in the context of your home. Research by Dr. Joseph Garcia, one of the founders of Baby Sign Language, found that a typical baby starting at seven months’ old needs just two months of solid repetition and exposure to a sign to start using it – a lot faster than walking and talking. So keep doing lots of repetition and before you know it, you will both be signing up a storm with your child. A good time to start Baby Sign Language is at six to nine months. At that age, babies start to be really receptive to signs, and you are almost certain to see some signing back in the next ten weeks. You can, of course, start even earlier. You can even do prenatal Baby Sign Language if you want! Babies whose parents begin teaching them signing at birth will learn a little quicker, but you do need to be more patient because you will have to sign to them for longer. You may be lucky enough to have your child be an early signer, but you should not expect results before your baby is at least seven months’ old. There are three times when you can perform the sign: before, during, and after the event you are trying to communicate. Try to do all three. For example, if you want to teach the baby sign for dog, first make the sign as the dog approaches, then as the dog comes to your baby, and then again as the dog leaves. You will need to keep your signs in your baby’s field of vision. Try to wait until your baby’s gaze and attention comes toward you; you may need to re-position yourself or your baby so that you are between him and the subject. There is no need to try to force the issue if your baby is distracted. Don’t worry, your baby’s attention will return to you eventually, and you will have lots of other chances to make the sign. The majority of your signing practice is going to come from signing during daily routines. Young children thrive on routine and repetition, so set the stage for success by making sure signing with your baby takes place in the context of daily activities. For example, your baby’s day may start with cereal. You might pour baby a little cereal, and then sign “more” before giving him a little more. This will continue until he is all done. You could do a similar routine during each meal. Other typical routines throughout the day may include changing diapers, bath time, walking time, being put down for a nap, and turning on/off the light. In addition to the signs you will use in day-to-day life, you can create opportunities to sign less-common signs. You can read books, sing songs, or do flash cards to teach these signs. For example, while reading a board book about animals, you may get several opportunities to make animal signs that you would not encounter in everyday life. 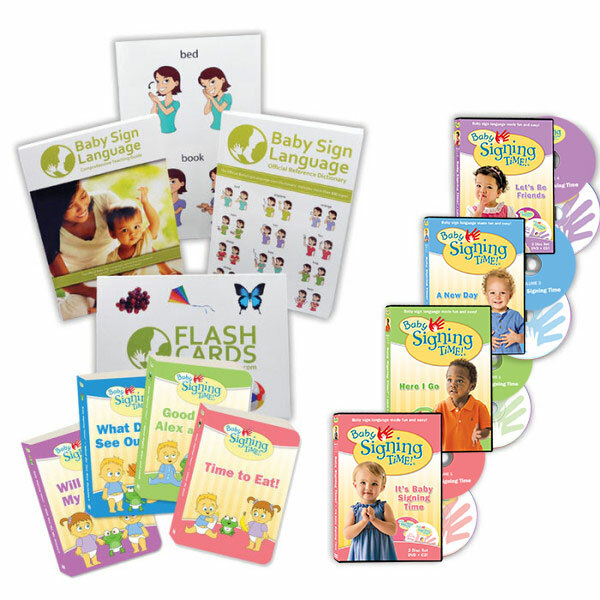 As your child gets more advanced and acquires more signs, a lot of the repetition is going to come from baby-initiated signing. Baby will see or recall something then make the sign, for example, signing hungry. When baby makes a sign, you should acknowledge the sign by signing back and saying the word out loud. As baby expands her vocabulary and understanding, you can follow up with a question. For example, you can ask if he wants cheese or bread. Hi, I had a big success with baby sign with my daughter. We had great time and she was a fast learner, she started her first sign at 11 months and she could do up til almost 100 signs before she reached 2 year old. We are trilingual family. so I found it very useful and had created such a big bond between me and her and she almost didnt have problem with TT2. I have started signing with my little son since he was 9 months with couple basics signs like milk more and eat. Now he is 13 months. He signs some words like milk or dog but not at the right time. Instead, he just cries and grab my shirt when he wants to nurse. Or when I say dog, he tap on his legs but when he see the real do or picture of dog, he never sign. He still doesnt know how does it really work. its it normal that it takes so much time to sign back and use it correctly? We are so delighted to hear about your daughter and your shared success with baby sign language. From what you are telling me your boy is showing comprehension and finding ways to communicate his needs. I am also encouraged to hear that he associates a real dog with the sign for dog. In my personal experience boys learn through experiences where girls tend to be more responsive to visuals like flash cards. Consider using model figures such as a collection of farm animals or try to engage him in signing while eating. You could place his favorite foods in front of him and show him how to ask for each food by name. 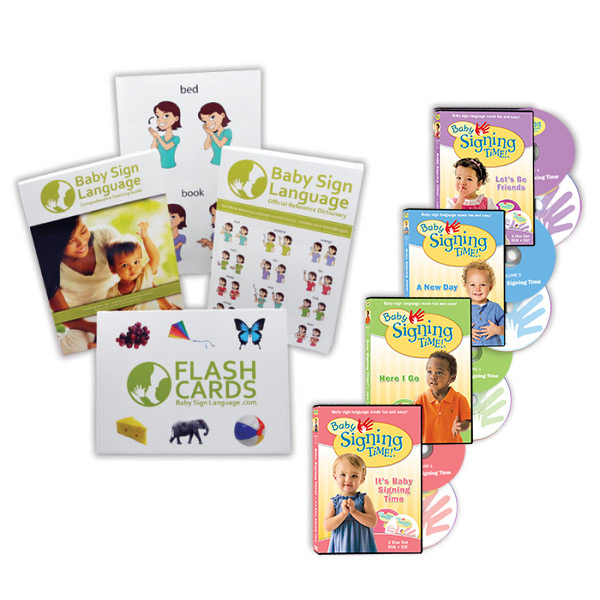 Our Teaching Guide available in the Baby Sign Language Kits contains advanced teaching methods to help you expand on your approach. Hi, My baby is 11 months old and I want to start teaching her sign languages. I’m Mexican living in Mexico, but since my husband and I are bilingual, we used to speak to our baby in English while we are at home (she is in day care most of the day). It is ok to teach her sign language in English (I mean the associated word) or should I translate the word to spanish? 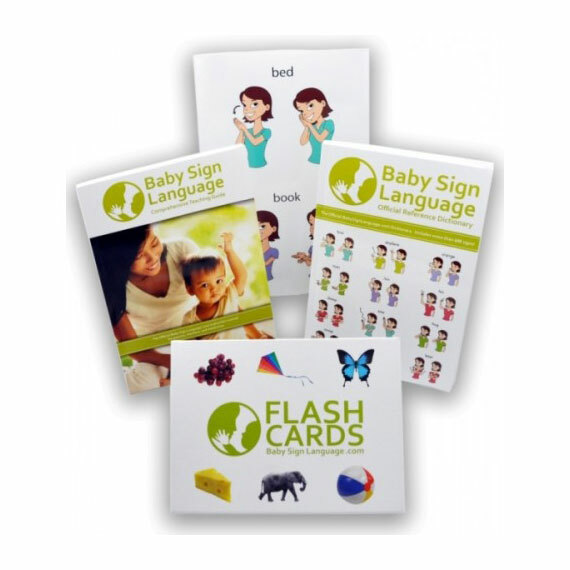 Many multilingual homes use baby sign language as a bridging tool between languages. Use it both when speaking English and Spanish. I have been using the sign for milk (and saying milk) before every nursing session for a month or two. My six month old has started signing it back to me today, and when he does I nurse him to reinforce the meaning. The only problem is he’s teething and is now doing the sign every 10 minutes because he likes to nurse when his mouth is sore. Do I have to nurse him every time? I want to acknowledge the sign, but cant nurse him constantly! Hello! Have you noticed your video has the wrong spelling for Repetition? other than that, what a great site! Congrats! Thank you. We will fix that up it our next round of video work.